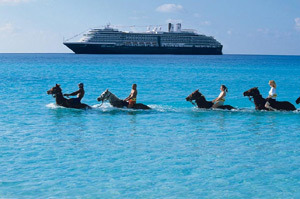 Luxury cruise line, Holland America Line, have announced plans for two of their ships to sail on Grand Voyages in 2013. The line's flagship, ms Amsterdam and the popular ms Prinsendam will both offer two cruises, taking in over 120 ports of call in 65 countries, over 322 cruising days. Holland America's ms Amsterdam is set to sail on a 115 day Grand World Voyage in January with a 75 day Grand Pacific and Far East tour in autumn. Prinsendam will depart on its first Grand Voyage in January, with a 68 day Grand South America and Antarctica Voyage, which will be followed immediately by a 64 day Grand Mediterranean Voyage. Richard Meadows, Executive Vice President for Holland America Line, said: "We’ve designed Holland America Line's 2013 Grand Voyages itineraries to feature some of the most sought-after sights and experiences in the world. Even the most experienced traveller will be inspired and impressed by our carefully crafted selection of port calls, maiden visits and extended stays." All four Grand Voyages are available to book now, so if luxury American-style cruising and a Grand Voyage are up your street, you'll want to get in quick before all of the best deals and cabins go.